Apply as a team, launch an MVP in one semester. 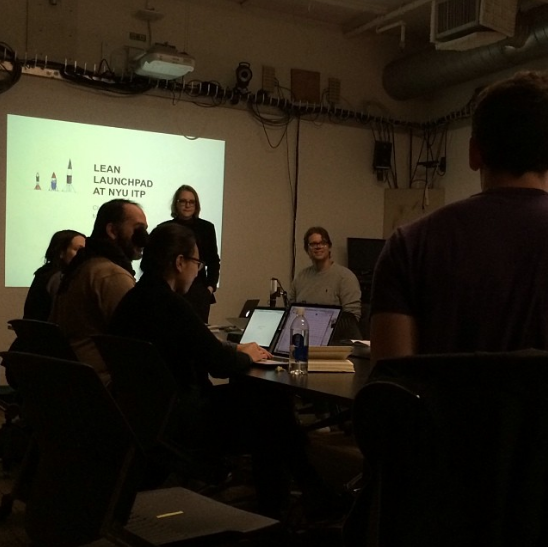 NYU ITP is offering for the second time a for-credit Lean class designed to get your team to a minimum viable product launch within one semester. This course is open to all enrolled NYU students, and you are invited to join a team or submit a team for consideration. We embrace a creative, iterative, and collaborative approach to making things: software, hardware, and things in between. Our method: we offer equal parts Lean Startup/Lean LaunchPad methodology, with a hands-on approach to learning user experience design (even if you have only sketched wireframes in your mind before taking the class). We have re-designed the course for Spring 2015 to get you to value proposition fit by the end of the semester. The course is taught by adjuncts Josh Knolwes and Jen van der Meer, and is supported by a tremendous network of mentors and advisors who are actively involved in the class. We’ll introduce you to likeminded entrepreneurial teams who are forming to apply for the course, and give you an overview of the lean method as it has been adapted for ITP, and the mentors, and advisors signing up for the spring semester. We recommend team members with core skills of entrepreneurship and making including design, code/engineering, ethnography, and customer development/networking. Come if you are an individual looking to join a team, or you have a fully developed team and are curious about how the course will be structured. Teams will be invited to present concepts and participate in an interview with the course instructors and mentors. We will curate a mix of concepts and teams for maximum diversity of ideas, skills, and collaborative team member experiences. Contact Jen van der Meer – jd1159@nyu.edu to for questions about how to apply, or watch for updates on the class blog. What happens when you ask your network for help? Here’s the first thing I learned when teaching Lean LaunchPad at NYU ITP. The structure and blueprint as taught at Stanford was essential to strengthening the ecosystem: a large group of Advisors as lecturers and helpful participants, and individual Mentors assigned to each team. The Mentor ask was big in a town filled with busy people – come each week for the full 3 hour class, and then host additional time with the teams to keep them progressing through the Business Model Canvas, and the course. There was skepticism that NYC, and NYU, and ITP was ready for this level of commitment, on a volunteer basis. Would we really get people to show up every week? I was skeptical of my own network – I had spent my career based in NY, but often tethered to the Bay Area. Did I have in my own network the former founders, investors, and experts we’d need to structure the course? Could I compel these people to give so much time? The first person I asked was incredulous that anyone “worthwhile” would have the time to be a mentor. He wanted something back. Money, stats, something in exchange for this time. I doubted myself, and all of New York City. Would we ever build a successful ecosystem if everybody in the food chain wanted cash, upfront? I hesitated for a whole week, wondering if I should restructure the mentor’s role, but then started again, looking for people that were former founders who had exited, former big execs who were about to leave their big companies to found a startup, and actively engaged experts who were eager to support startup teams. Then it turned out – everyone I asked, or Josh Knowles my co-teacher asked, said yes. At local conferences, even at SXSW in Austin, we picked up more advisors, more lecturers – looking not just for the easy success stories, but those that had recently exited or folded their businesses, or those that joined after the founding team got started, or those that we about to begin again. Along the way visiting advisors asked if they could come back again, and we gained a few more mentors along the way. And thanks to NYU ITP, and the NYU Entrepreneur’s Institute for supporting this big experiment. We’re now in development towards MVP mode – all but one team has validated the primary segment and are deep in prototyping, building, and validating. We had Leah Hunter from CCA, Fast Co in to tell us about ethnography methods, and the common ground between Bay Area and NYC startup ecosystems. We focused on activities, resources, and costs – with a deep dive on finances and innovation coming from the JOBS act, and the America Competes Act in the US. And we augmented the Lean LaunchPad method with a deep dive on Customer Development – translating personas into the first set of features, and marketing measures to test. Here are Ajay Revel’s slides – and please reach out to her as you do these exercises on your own. Thanks to guest speakers Travis Hardman, and John Bachir. This week: Guest Speaker Phoebe Espiritu from TechStars, and our Mentors. Here is this week’s lecture/workshop on revenue and distribution. We are glad to have incredible variety in direct vs. indirect, web vs. mobile vs. google glass distribution. For next week: What experiments will you run to test your revenue strategy? · Results of last week’s experiments. What passed, what failed, what did you learn? We covered the Value Proposition, and pain-driven design, and with additional design research and lean ux approaches to get underneath stated, easy-to-find pain points. Thanks Tarikh Korula for telling us the story of Seen.co. Watch the Customer Segments lecture. Read Business Model Generation, 126-145. Post discovery narratives on your team blog. How to format for next week – and this is critical to ensure that your team can cover what you need to cover in the 5 minutes. Cover slide WITH YOUR NAMES and your quick description. What hypotheses related to your value proposition and segments did you test last week. What did you validate. What did you invalidate. Who did you talk to in order to validate these hypotheses. Propose experiments to test your customer segments. What constitutes a pass/fail signal for each test? Universal Methods of Design: Bella Harrington, Bruce Hanington.